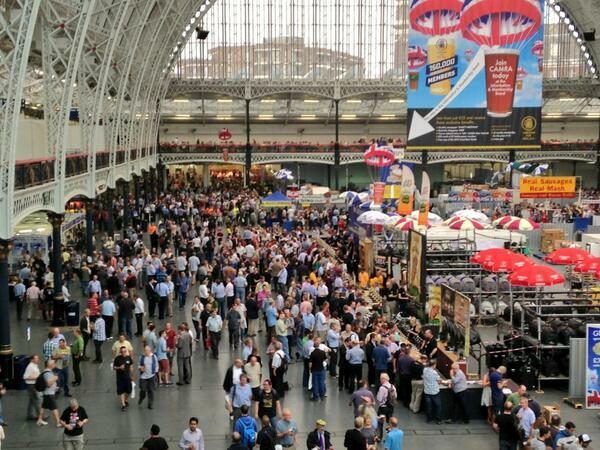 Last week, the Great British Beer Festival (GBBF) was held in London’s Kensington Olympia. 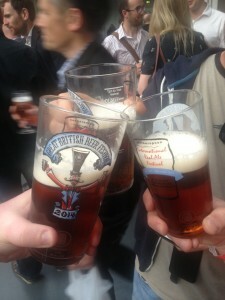 This was my fifth consecutive GBBF. It’s not quite the exploits of Michael Phelps and Steve Redgrave but it still makes me smile. It has become firmly an annual jaunt over to London. 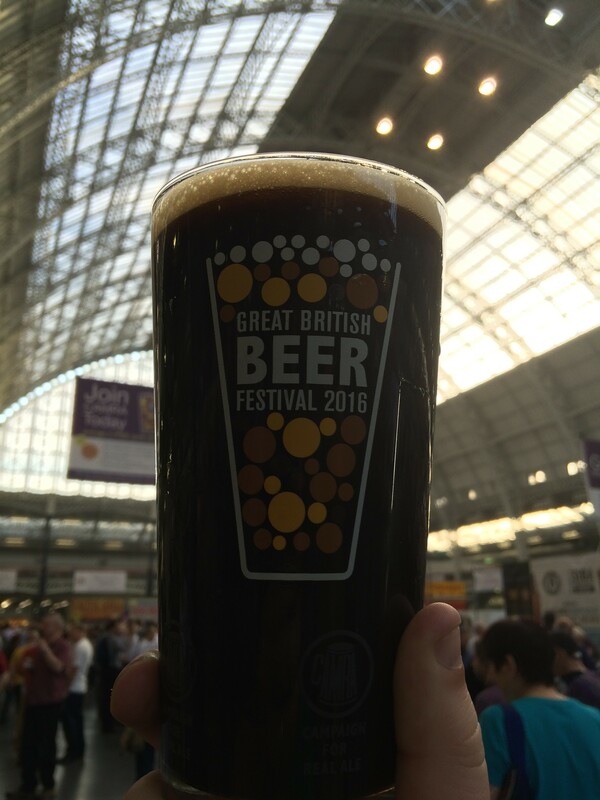 GBBF 2016 had a slightly different feel to it over previous years. It seemed as there were one or two fewer brewery bars. Some big brewers like Shephard Neame relegated its sole beer (Spitfire) at the festival to a shared bar, which in the grand scheme of things is no big loss. The festival certainly had a more corporate feel to it, if by corporate one means organised. It felt more spacious than previous years. This is more space on top of what is already the cavernous environment that is the Kensington Olympia venue. There was a big push by CAMRA to sign up new members. Some had the air of chuggers about them, keen to push the £20 Wetherspoon vouchers above all else. Corporate hospitality featured also with groups given guided tours, tastings etc. This is becoming the norm it seems at large festivals these days. 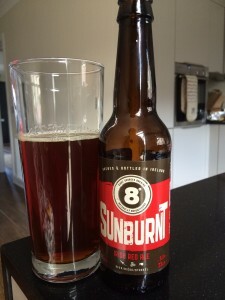 The organisers managed to invoke the ire of many a beer geek, who are known for their carefree attitude, by moving the announcement of the Champion Beer of Britain from the event itself to a separate awards dinner. This didn’t go down well at the festival and contributed to a fairly muted atmosphere during the afternoon of the trade day. However, many a beer writer quickly jettisoned his/her umbrage as the American Cask Bar opened around that time. The presence of international beers at GBBF is always contentious. Yes it’s sad to see so many beer people crowded around the American beer bar. Then again the U.S. Brewer’s Association put in a lot of work to make sure the beers present are interesting, eclectic and first-rate. What’s more is that they pay tribute (except for the international bottle bar) to cask ale. They also throw in appearances by brewers or others connected with the breweries. It’s no wonder this bar’s popularity will continue, they put in a serious effort to make it exciting. Unfortunately, two Vermont breweries were due to be there but their beers missed the shipping deadline. For the record, the U.S. beers I tried were Ziggy Stardust (Boulder Beer Co.), Daydream IPA (Santiam Brewing); Hop Hunter IPA (Sierra Nevada); and Spruce Tip Session Ale (Urban Farm Fermentory). Anyway back to the Champion Beer of Britain. I was expecting some ardent CAMRA folk to have picketed the dinner. Did it happen? I don’t know but then again coverage of the actual awards dinner on twitter was poor. There seemed to be only two people tweeting from the event. I was keeping an eye on proceedings more out of curiosity to see if any of the beers I had tried during the first day made the final three. As luck would have it, my brother Eoin had a pint of Binghams Vanilla Stout in front of him. It was his beer for the road. 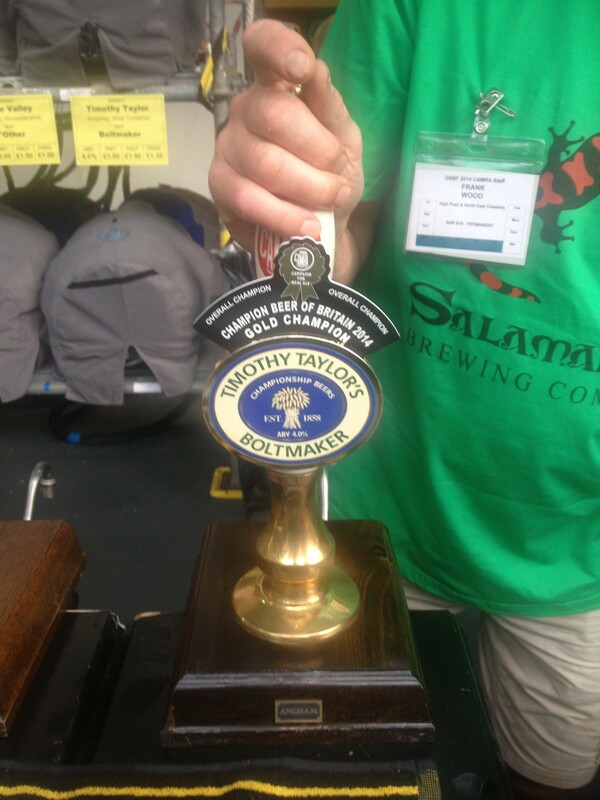 That was probably the last pint of it (or close to it) sold at the festival during the rest of the week – the Supreme Champion Beer of Britain being limited to third or half-pint pours. Thankfully, I had tried it earlier because it would’ve made the brother’s smugness all the more unbearable. 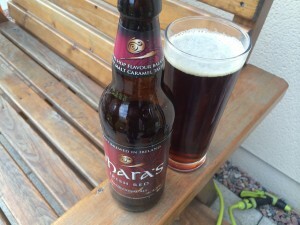 The beer was smooth, silky with a pleasant vanilla hit – reminiscent of a quality chocolate truffle. Whilst there was a hint of sweetness in it, the vanilla didn’t overpower the character of this beer. It was well-balanced and drinkable. This year’s three overall medallists would be even more enjoyable when the weather gets colder. It was also the first time a speciality beer won the overall prize and no doubt will be an answer in many a future CAMRA themed table quiz. There was obviously a preference amongst the judges for darker beers this year. 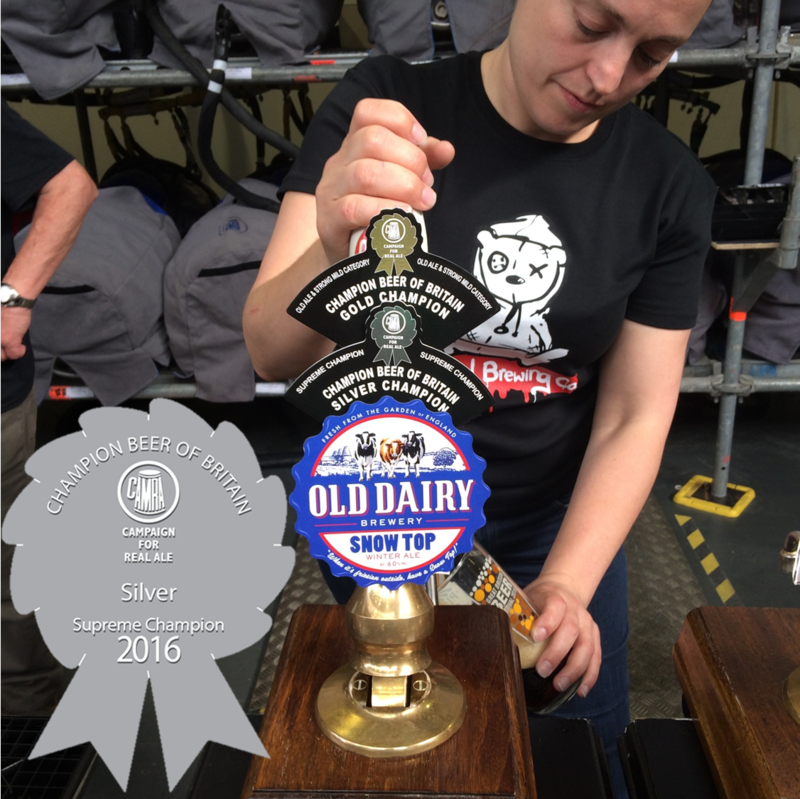 Snow Top by Old Dairy, a 6% abv (plenty of spice, winter fruits on the nose, warming and toasty) took silver and Tring’s Death or Glory, a 7.2% abv barley wine (not overly sweet, dark fruits, marmalade, and spice) taking home the bronze. There were some excellent stouts and porters on offer. Particular highlights for me were Crafty Stoat (Wibblers); Old Growler (Nethergate); Boss Black (Boss); Lambeth Walk (By the Horns); and Parabellum Milk Stout (Gun); Triple Chocoholic (Saltaire); and Chocolate Marble (Marble). Speaking of Marble, I enjoyed its lemony Earl Grey IPA and thought Lagonda IPA deserved better than bronze in the golden ale category. Other pale and IPAs worth a shout out include Nova (Bristol Beer Factory); Nor’ Hop (Moor Beer); Revelation (Dark Star); Magus (Durham); 77 (Heavy Industry); and Gyle 1500 (Flowerpots), although it’s billed as a red ale, given its hop profile it can pass somewhat as a red IPA. In case you’re wondering, no I did not forget to sample some mild and yes, I did try Fullers annual Vintage release. The 2016 version had plenty of the expectant vinuous notes, it could do with a bit more ageing. A nice touch at the festival was to be found just inside the front door. Too often London breweries were underrepresented at the festival. This was a shame because there’s some amazing things happening in the city’s local beer scene. 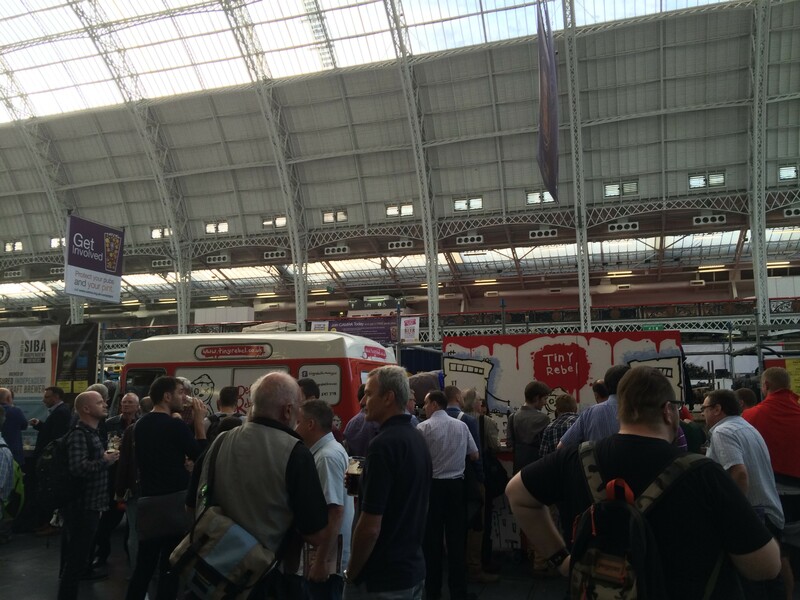 London Beer City grew up in and around GBBF and some might say, in response to it. London is definitely a front line in the craft versus real ale battle. 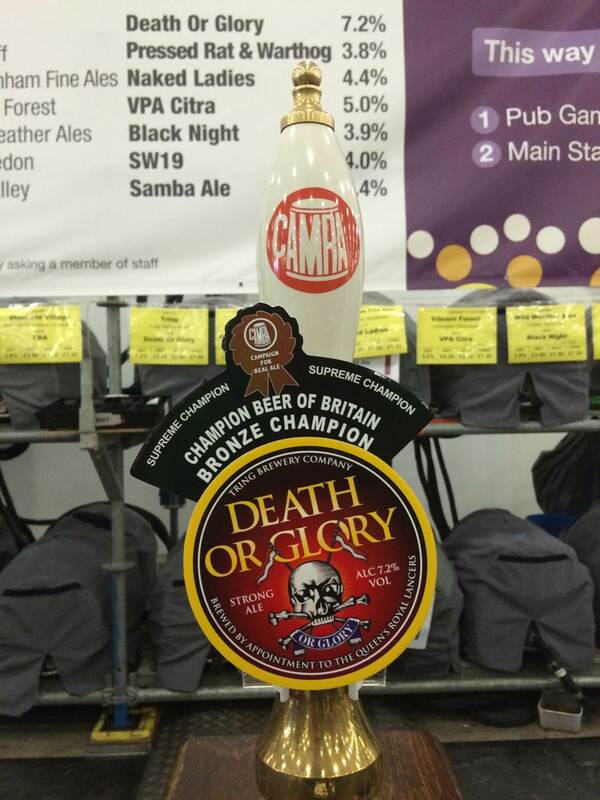 Thankfully, the Real Ale in a Bottle bar returned to GBBF this year with offerings (all bottle conditioned) from Kernel, Redemption, Orbit, Partizan and others. Giving myself a break from the cask offerings, I enjoyed Weird Beard’s Saison 14. It hit all the right notes, with plenty of esters and leather in the flavour. The carbonation levels were spot on and set me up nicely for more beer tasting. I must say that Weird Beard is certainly a brewery that’s getting better both in terms of quality and consistency. Earlier I mentioned that there seemed to be fewer brewery bars at the festival. There was an especially welcome new one. Tiny Rebel has gone from strength to strength since winning the Supreme Champion Beer of Britain accolade last year for Cwtch (still tasting great). Of course, they made a name for themselves well before winning the title but the brewery appears to have stepped up a gear. The brewery was out in force at the festival and besides the likes of Fubar and Hadouken, it had Hank, a wonderful session pale ale and Juicy, which as its name suggests was a vibrant fruity all-rounder. As you probably guessed, I spent a fair bit of time at the Tiny Rebel bar, enjoying those beers mentioned, along with their black IPA Loki. It pleasantly avoided even the slightest hints of dark roast and opting to focus on bitter citrus notes. Finally, I could not but try Stay Puft, a 5.2% marshmallow stout. I was a little uncertain of this beer when I first tried it and on the second day, I bit the bullet and tried it again. I admit that this beer grew on me. It wasn’t overly sweet even though that’s fear elicited by its name and description. The best description would be of a thick and creamy milk(shake) stout. Interesting and was worth having a pint of it. All in all, it was a good festival. More could be done to improve it. There was a lack of atmosphere on the first day that continued into the afternoon of the second day. The venue’s cavernous and could do with a bit of music. Perhaps various buskers dotted around the venue, not just on the stage. The food offering was the best yet. Talk already started of next year’s trip to GBBF 2017. Beer festivals are fantastic for discovering new beers and breweries. 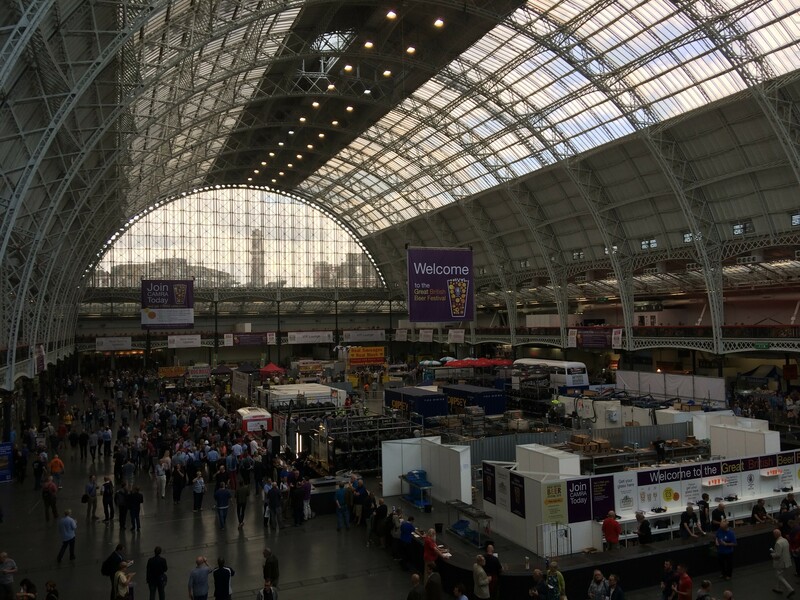 The Great British Beer Festival kicks off today and I’ve put together the following advice based on experience of attending the festival this week. 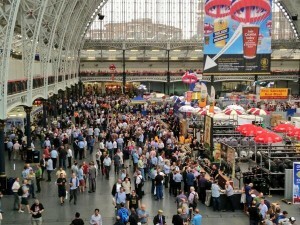 Develop a plan of attack: The GBBF is big and spread out. The festival bars are manned by enthusiastic volunteers but some of the larger breweries like Fuller’s, Brain’s, St. Austell and Shepherd Neame have their own stands. The beers are grouped by region not alphabetically. The official festival website has a beer finder tool (http://gbbf.org.uk/beers/beerfinder) but also don’t forget that the festival programme is a worthwhile investment. Don’t ask, don’t learn: Confused about beer, don’t know what a IPA is or what hops do? Ask. Beer festivals aren’t just for beer nerds like me (don’t worry there’ll be plenty of us at the festival) and don’t feel intimidated by other people asking fairly intense questions. Feel free to tell people behind the bars what styles you like and let them suggest beers to try, although this may be harder to do when it’s busy. Also, why not consider booking a place or two on one the tutored tastings running throughout the festival. Leave the darker, heavier beers to last: A simple Belgian rule is starting with the lighter beers first and move in ascending order of alcohol strength before moving gradually darker. It’s basically about intensity of flavour, try a hoppy beer before a lager for example and you may not be able to detect little else but carbonated water. Obviously there are exceptions to the rule – lambics, anyone? Sample before you buy: Festivals are a time to discover something new as well as reacquainting yourself with old friends. Don’t be afraid to ask before you buy. It’s a great way of getting to learn about different styles and tick off a number of the beers at a festival, although be considerate and try not to abuse this. Also, remember the beers are served in three measures (third, half or pint) and priced accordingly so there’s plenty of time to sample without breaking the bank. Try a winning beer: This is not just a beer festival it’s also the British Open of beers. 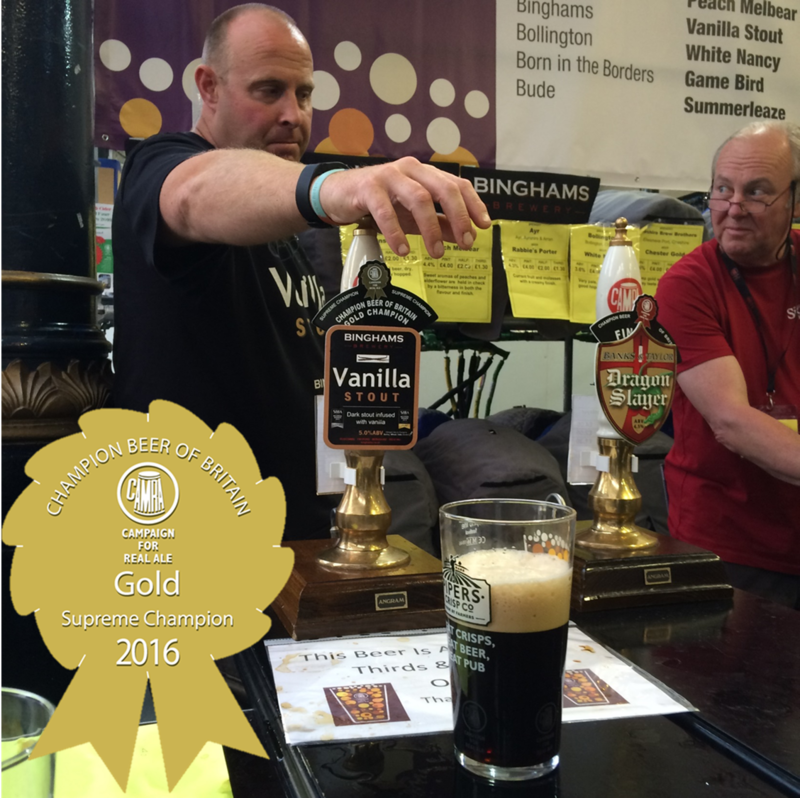 On the opening day of the festival, the Supreme Champion in CAMRA’s Champion Beer of Beer competition and the category winners will be announced. Their pump-clips will indicate the prize they’ve won. Expect some of these beers to run dry quite quickly as brewers may be caught by surprise by not having enough kegs at the festival or others will be put on at special times throughout the festival and served in limited quantities. It’s not just British beers: The international bars at the festival have beers from all over the world. Many a beer aficionado can be found crowded around them looking to try beers from Europe and beyond. Some are served on cask, some draught and others may require you to purchase the bottle or can. Also, remember some of these can be purchased to enjoy at home. If you don’t want to carry them about, there’s a cloakroom at the festival for storage but might be worth bringing your own bag to put them in. Take notes: This can be as simple as noting down the beers you like, you can quickly forget otherwise. I’ll leave it up to you how best to record what you tried, some guides have notes sections under the beers or others can be simply recorded on the back of beer mats etc (I use my iPhone for instance). However, I must warn you that this can quickly become addictive and and you could be in danger of becoming a “beer ticker” like the rest of us. Take to social media: Festivals can feature limited runs or rotating taps of beers that you might want to try. Also, some beers may be even more popular than expected and run out early. 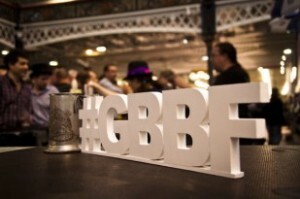 Twitter can be a great way of finding up to the minute information on latest developments, so get learning the hashtag for the festival (#gbbf2015). If you like a beer or brewery, take a photo and tell the world. Following a brewery that you like is a great way of finding out if they’re coming to an outlet near you. Food: Beer and food matching is a real thing. Check out if they’re food stands and use it as an opportunity to try first hand what styles of beers go with particular foods. Who knows you might be doing the food vendor a favour! Don’t forget to drink water: This is my version of the “Surgeon General’s Warning”, you can easily pass more than a couple of hours at a beer festival, so hydration will be an issue (especially as the venue heats up) as it is with drinking in general but it also helps cleanse the palate and will assist you moving from beer to beer and appreciating each one on their merits. Wow, what an election that proved to be over there in Britain. I had an eerie feeling that it could prove to be ’92 all over again for Labour. In certain areas it was even worse. While they retain control of every former mining area, they ‘lost’ Scotland. The SNP, the real surprising force, now occupies the third party spot, previously held by the Liberal Democrats in Westminster. And with 56 out of a total of 59 seats, they are the undisputed party of Scotland. 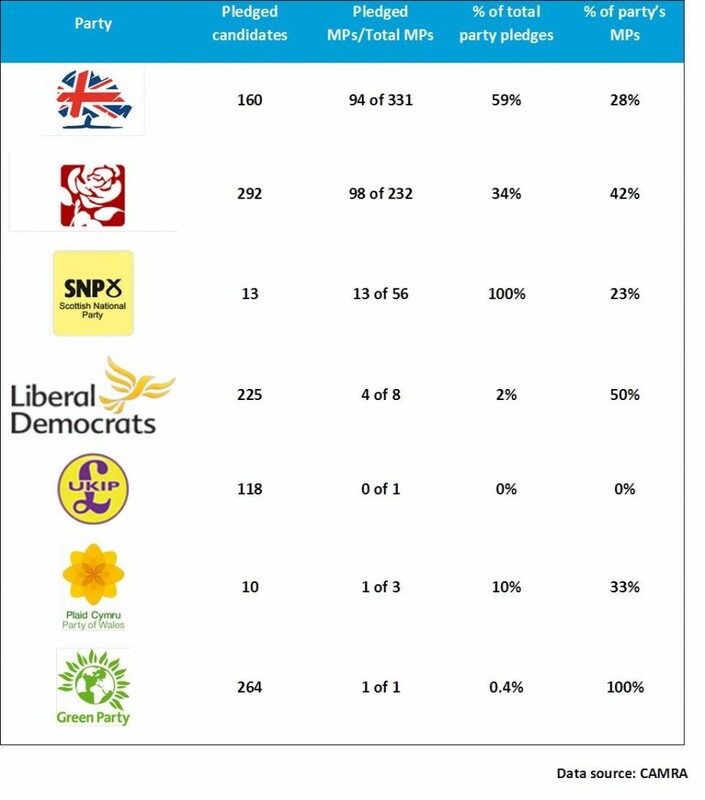 Whereas UKIP and the Green Party received 15% of the popular vote, they only managed one MP each. In an election full of surprises, few expected the Conservatives to win an outright majority. However, this could prove to be a pyrrhic victory. Without the Lib Dem crutch, they could find themselves at the mercy of their Eurosceptic wing. Last month, I featured a piece on what the election could do for beer (British general election 2015: political pint scoring). Now in its aftermath it is time to look at what is likely to happen. The Queen’s Speech to parliament contained few bills that would have direct impact on the British beer industry. This is hardly surprising, as the Tories wish to remain silent on the issue of Minimum Unit Pricing, for the time being at least. It could be back on the agenda pending the outcome of the legal challenge to the Scottish equivalent. In a move that will boost consumer demand generally but will spill over to beer, the Treasury will not increase income tax rates, VAT and national insurance before 2020 at the earliest (i.e. not before the next general election, providing it goes full-term). 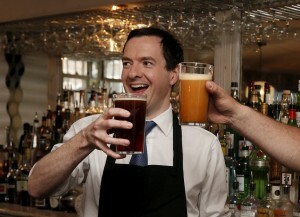 What is unknown is whether George Osbourne will reduce excise duty for a fourth consecutive time. There is a second 2015 budget scheduled for July 8. But this emergency budget is likely to focus on measures to reduce the deficit. We may have to wait until Budget 2016 before seeing any additional moves on excise. Britain needs to address the legacy of the duty escalator, which caused excise to increase by 42% between 2008 and 2012. Back as Chancellor, will George Osborne continue work to reverse the “beer tax”? The British political scene is marked by “buzzword” overkill. This could be observed when the British monarch confirmed that her government will be doing the hokey cokey on the Brussels dancefloor in the lead up to an “in-out referendum” to be held by the end of 2017. Speculation is mounting that it is likely to be held sometime in the autumn of next year. Cameron won’t want this issue to completely dominate the national agenda and the longer it drags on, the less stable his government could be. The deal he will seek to do with Brussels will focus primarily on regulatory issues and possible opt-outs. These discussions and the subsequent referendum may attract a negative sentiment towards British imports across the EU, but this is likely to be over-stated. What is likely to happen is that more sectors of the British economy will publicly acknowledge the importance of the EU for their business. The brewing industry could well be one of them. While its practitioners may not agree with all aspects of labelling regulation, a move on the origins, ingredients and ownership issues would be supported by the likes of the Campaign for Real Ale (CAMRA). So too would dealing with certain issues as part of the EU-US trade deal, the Trans-Atlantic Investment Partnership. A new Enterprise Bill will be introduced to Parliament with the objective of cutting £10bn worth of red tape. We can expect to see plenty of bizarre regulations appearing over the coming months to illustrate the types of reforms that will be introduced, such as the removal of fines for “No Smoking” signs being the wrong size or in the wrong font. 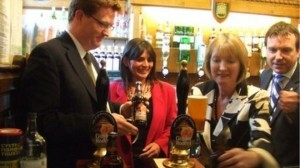 The main beneficiaries of this bill will be small businesses, which includes virtually all breweries in Britain. Business rates are to be reformed and a Small Business Conciliation Service will be introduced. This will be a low-cost mechanism for solving disputes (e.g. payments) and could bring benefits to the supply-chain dependent industry that is brewing. Energy costs are also likely to be addressed but as part of a separate bill. Devolution is back on the agenda, with added powers promised for Scotland and Wales. Expect to hear a lot about “metro regions” and the “northern powerhouse” (buzzword overkill?) as regional administration is reformed and new directly-elected mayors introduced. Pub goers can expect more integrated public transport across cities and not just London, apparently. Holyrood has recently agreed to commission a study into the tied-pub sector in Scotland to provide evidence on what changes need to occur. However, it remains to be seen whether any changes can be introduced ahead of next year’s Scottish parliamentary elections. CAMRA ran an effective campaign in the run-up to the general election and sought pledges from candidates to “support well-run community pubs”, “promote Britain’s 1,300 breweries” and “represent pub goers and beer drinkers”. Over 10,000 of its members contacted their local candidates to support these issues. The organisation received pledges from 1,162 candidates, of whom 211 were returned to Parliament. 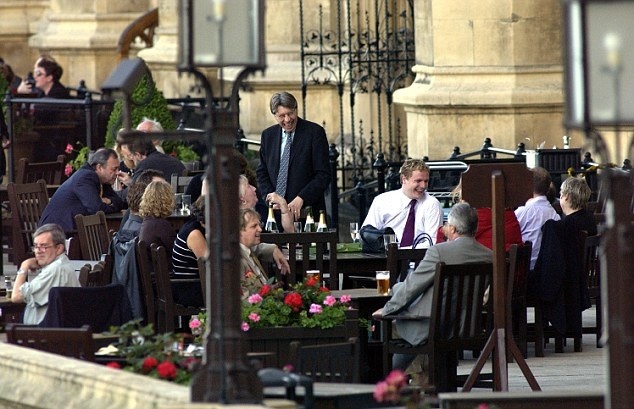 This means 32.5% of the MPs in Westminster have committed to supporting the beer industry. As the table below shows, this support is spread right across the board, with less than a third of the ruling Conservative Party pledging their commitment to beer. Oddly, UKIP’s sole MP, Douglas Carswell didn’t sign up to the campaign. This is in spite of UKIP incorporating these priorities in its manifesto, along with other issues close to CAMRA’s heart. 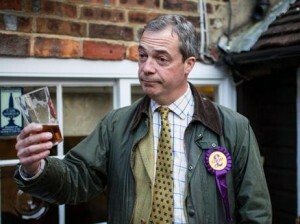 Perhaps he had enough of Nigel Farage’s endless “pint-ops” for Britain? But it’s early days and naturally it’s difficult to predict with any great certainty what the political landscape will look like next year let alone in five years’ time. What will happen to the likes of Nigel Farage? Will he finally be allowed to resign as UKIP’s leader? Obviously, alcohol will continue to be linked to health and crime policies by all parties. Regardless, I think “pint-ops” will be here to stay and the All-Party Parliamentary Beer Group will have some new faces. With the weather showing signs of summer and then not again, BBQ season is upon us. When I say BBQ, I mean grilling in the truest context and not slow roasting for 24 hours or longer. Lighting a BBQ can make it seem that way though. Think of all the hours of enjoyment standing over it trying to get the coals to catch fire. It’s made all worse by people sitting around watching and remarking on your every move. Comments such “did you use lighter fluid?” or the “quick fire bag of coal is brilliant” hitting you like accusatory daggers. Then eventually it lights, there may be an uneven heat across the grill requiring the frantic shuffling of burgers or whatnot around so they don’t burn too quickly. At least having beer on hand can take some of the edge off of the hassle of cooking al fresco. Yesterday, I had an excuse to work through a whole range of red ales (sadly Bay Ale from Galway Ale had disappeared from the fridge by the time I got there). It’s interesting putting different reds, like other beer styles, together to compare variations. Red ale is much maligned by the craft drinker, all too easily dismissed as one-dimensional or worse. For someone who was a fan of Writer’s Red (aka Rebel Red) by Franciscan Well and who drank it by the pitcher full in The Gingerman, I will always have a fondness for the style. At times I have acted in a manner that can only be described as quite frankly a bizarre sense of patriotism in standing up for the style to some CAMRA members all too quick to tell you what they think of it – it’s too gassy, too sweet etc. The style as we know it mightn’t be that old nor originating here but there’s no doubt that it has become associated with us. Classic reds may have similar flavour profiles to dry roasted peanuts, some may be too heavy on the caramel and others draw on bitterness for their identity. Who knows what the future holds for this style? It would perhaps be a stretch to see an attempt to adopt a Geographical Indicator status for the Irish red. The road is certainly open under the Transatlantic Trade and Investment Partnership (TTIP) for more products to adopt such status. Imagine, the likes of George Killian’s Irish Red having to alter its name. 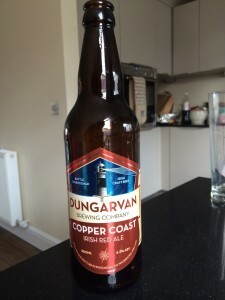 This is notwithstanding its very own identity crisis being marketed one time as an Irish red ale and now as a premium lager. 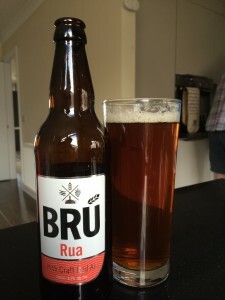 It’s unlikely the Irish beer industry would look to adopt a GI for the Irish Red Ale. The industry doesn’t act like that, well not yet anyway. Of course, property rights have been a feature of the beer industry. Marketing rights have been a key driver so too has been use of proprietary productin techniques along with informal IP protection techniques. Look at the Trappist breweries distinguishing them from other abbey beers. However, as the market becomes more competitive, more friction can be expected. Thankfully a lot of this can be resolved through dialogue and in cases where it looks like such an approach will fail, public outcry has so far convinced brewers to keep things out of court. It won’t always be like that however. We’re already seeing whiskey producers refining the definition of what is Irish whiskey. Will Irish cream liquor be next? Brewers are already making moves to protect what can be called “Irish”, a measure to stop “crafty” imports from the UK and elsewhere. They clearly want to prevent the somewhat duplicitous nature of labelling á la Irish smoked salmon v smoked Irish salmon happening here. A logo is but one small step. A GI for red ale may achieve little too. Beer styles are often products of many places. You may have to be fairly brazen to claim ownership of a beer style either collectively or individually. Look what Anchor Brewing did with “steam beer”, although it was important for lambic producers. I’d settle for a redoubling of the efforts to market craft beer and the people behind them by Government. This would match the enthusiasm of the brewers and consumers. Additionally, we have to give brewers the support to protect their IP, which dare I say it may include their brand, beer name and logos etc. All of this may seem a fairly long train of thought but that’s what you get when you BBQ. Plenty of time to muse about all and sundry. At least I had a few red ales to keep me company. Britain goes to the polls tomorrow. 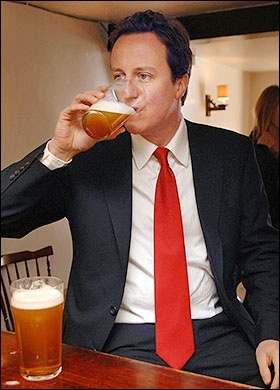 The outcome of General Election 2015 will likely have an effect on the British beer industry, well, the entire alcohol industry. As a bit of a political anorak, I couldn’t help but scan each party’s manifesto to see what alcohol measures were being put forward. The following doesn’t include other business-friendly policies, such as commitments to reduce business rates, which would benefit the brewing industry. Over the duration of this past parliament, an interesting shift has taken place in attitudes to the alcohol industry. This has been on the back of heavy lobbying by the Campaign for Real Ale (CAMRA), the Society of Independent Brewers (SIBA), publicans, the industry directly and a few umbrella campaigns. Tax breaks for small breweries were improved. The infamous duty escalator was abolished and Budget 2015 marked the third year in a row of cuts to the beer tax. These cuts were small but symbolic. The lasting impact, however, of the duty escalator remains. Between 2008 and 2012, excise duty on beer increased by 42%, thanks to the British economy witnessing high inflation during those years. This is the big reason that pints have been topping £4 and above. Of course, alcohol is again being singled out as a key contributor to crime and violence. A number of measures are being put forward to tackle the anti-social behaviour. More support is being promised by the majority of parties to tackle the issue of alcohol dependency. These are the ‘old dependables’ in policy terms. The introduction of minimum unit pricing (MUP) seems to be the flavour of the day. The rationale put forward is that it will help to curb alcohol-fuelled violence and reduce binge drinking etc. Interestingly, the Conservative party remains silent on the issue. Back in 2013, the party ditched plans to introduce such a measure at the eleventh hour. Only UKIP remain vehemently opposed to MUP. While some are awaiting the outcome of the legal challenge to the Scottish case (Liberal Democrats), others go so far as to suggest prices to be charged per unit. This can range from 50p per unit on all alcohol (Plaid Cymru) to “40p per unit of beer and cider to 50p per unit of spirits” (Ulster Unionist Party). Alcohol sponsorship of sport is also proving to be a hot topic. Yes, this may be more of an issue for macro-breweries but there are potential local issues involving regional and small breweries. While we may not see it in football, there are a number of county cricket teams that receive some sponsorship from their local breweries. This is not to say it doesn’t happen with rugby. The Green King IPA Championship aside, local clubs often look to their local breweries for support. The Tories, Labour and UKIP are campaigning to retain such sponsorship. The Lib Dems are silent on the issue but the Greens are against such sponsorship and are advocating a complete ban on “advertising (direct or indirect) and product placement on remuneration or reward”. Two parties are actively promoting ‘personal freedom’ policies but come at it from completely different angles. The Green Party wants to decriminalise cannabis because “people should not be criminalised for the recreational use of a drug which is no more harmful than alcohol or tobacco”. In fact, they want to regulate it in a similar manner to alcohol and they are pushing for tougher regulations on alcohol. On the other hand, UKIP wants to reverse the plain packaging legislation and to “amend the smoking ban to give pubs and clubs the choice to open smoking rooms provided they are properly ventilated and physically separated from non-smoking areas”. This is not to say that policies won’t pop up in the next Parliament. Some may be harder to enact. Examples of such policies may be along the lines of UKIP’s one-time policy to ban long-term welfare recipients from buying alcohol and the Scottish National Party’s attempts to prohibit purchasing of alcohol online from English retailers. Other examples might include banning happy hours in Northern Ireland and the DUP proposal to explore the introduction of a rates levy on off licences and supermarkets that sell alcohol. The revenue generated by this “could be used for dealing with adverse impacts of alcohol abuse in society”. The Green Party wants to go so far as to increase the tax on the “net profits of tobacco companies and companies producing alcohol for consumption”. These proposed taxes would be in propoprtion to the amount of alcohol in the finished products. 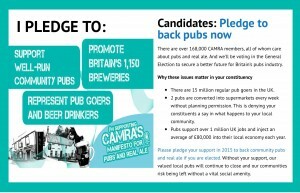 CAMRA have been running a visible campaign (www.ge2015.camra.org.uk) in the run-up to the general election, including stands at the main party conferences. They have received pledges from over 1,000 prospective MPs to “support well-run community pubs”, “promote Britain’s 1,300 breweries” and “represent pub goers and beer drinkers”. This includes letters from Ed Miliband and David Cameron. 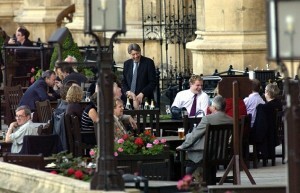 “The Labour Party are leading the pack as most pub and beer friendly,” according to the real ale body, with pledges from 292 election candidates, “followed closely by the Green Party (264), with Liberal Democrats in third place (225), Conservatives in fourth (160), and UKIP bringing up the rear in fifth (118), although famously pro-pub UKIP leader Nigel Farage is among those pledging support”. 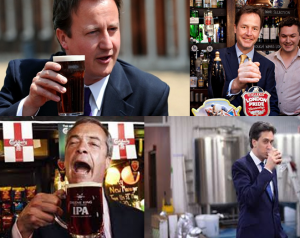 Food and drink have played a visible part in the general election campaign, from Ed Miliband bungling the eating of a bacon sandwich to the constant photos of Nigel Farage with a pint in hand. They’re easy props for photo ops, but they’re very presence may be significant. It’s reasonable to assume that the recent policy developments and new promises could indeed herald better times for Britain’s beer industry. Of course, if a voter casts their ballot purely on the basis of what their MP might do for alcohol, their beer goggles might be on a little tight… But as a beer lover, I have to say, I’ve heard worse reasons for going out and voting.